Here is the latest workbox style arrangement for our 5 year old preschoolers which will allow them to get the direct instruction from me that they need as they learn basic reading and writing skills, while at the same time having some degree of independence in their other work. I have always invested some time in one-on-one teaching at this age because helping each child to become a proficient reader is one of the keys to independent learning and self-educating later on (one of my goals for all my children.) The children have access to plenty of creative play opportunities and lots of great hands-on learning tools at other times in the day but this morning period is slightly more “bookish” as we step into more formalised learning. I researched workbox homeschooling several years ago and most of the examples I found on the web involved nightly or at least weekly changing of the contents. I knew that wasn’t going to work for me so I devised a simple system that only needed to be changed out about once a month. (See details here.) 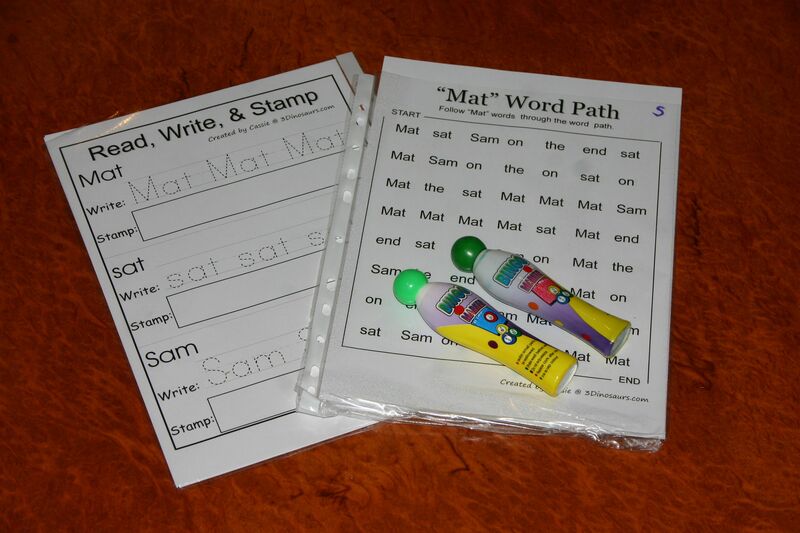 There will be some items in the boxes that needs to be updated more regularly (Sight words as they are learnt for example) but this will require minimal effort as the sets of words etc. that I need are all ready to go. Some advice that I always give beginner homeschoolers, especially those with a large family, is to set their homeschool up so that it will continue to run without them as much as is possible. Life intrudes; an unexpected visitor, an unscheduled phone call, the baby is sick and on and on. Set things up so that you are not required to be “teaching” directly all the time or the pace may be too hard to keep up. With only one or two children you may be able to do it but not with the number of blessings we have! So.. what’s in the boxes? Segmenting words game based on All About Spelling level 1. I am using this programme as a rough guide at this stage. We will get into it more next year but for now our activities are loosely base around the progression in this book which is very thorough. We are using the flip boxes to review the single sounds we already know before moving on to more complex phonograms. 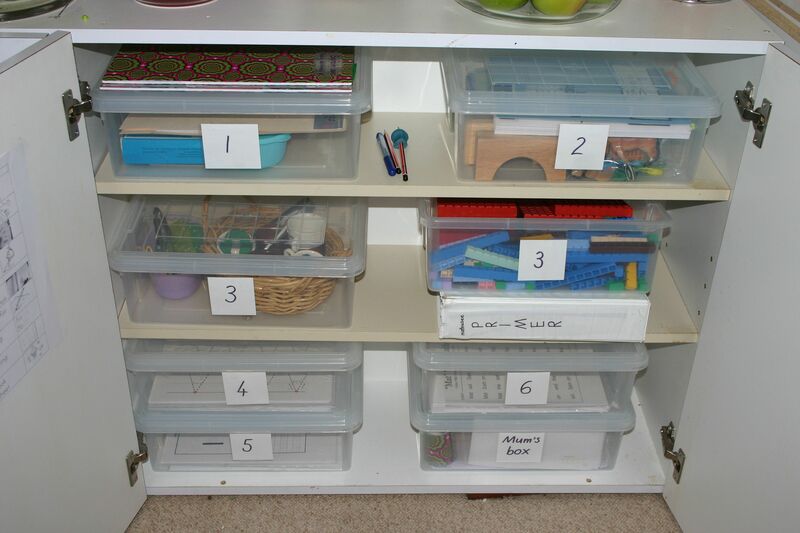 Montessori style counting activity tray. 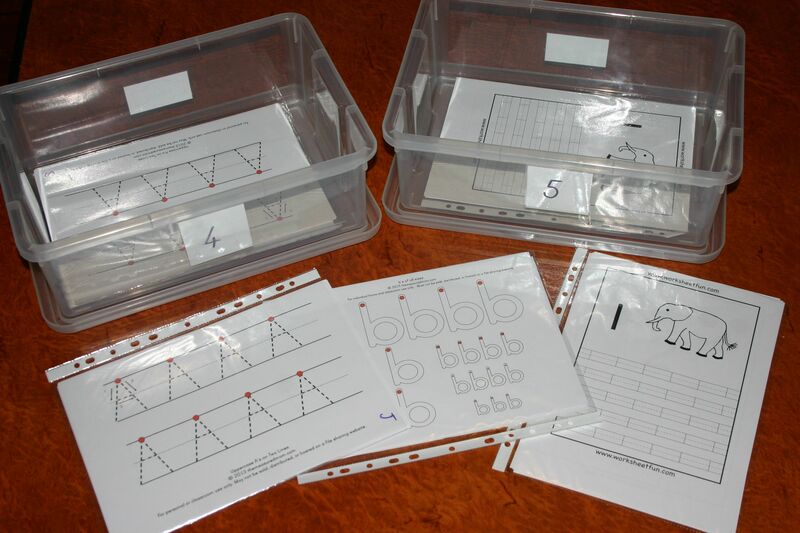 Developing one-to-one correspondence is crucial before any real maths skills can be developed and these simple counting activities give heaps of practise while also working on fine motor skills. 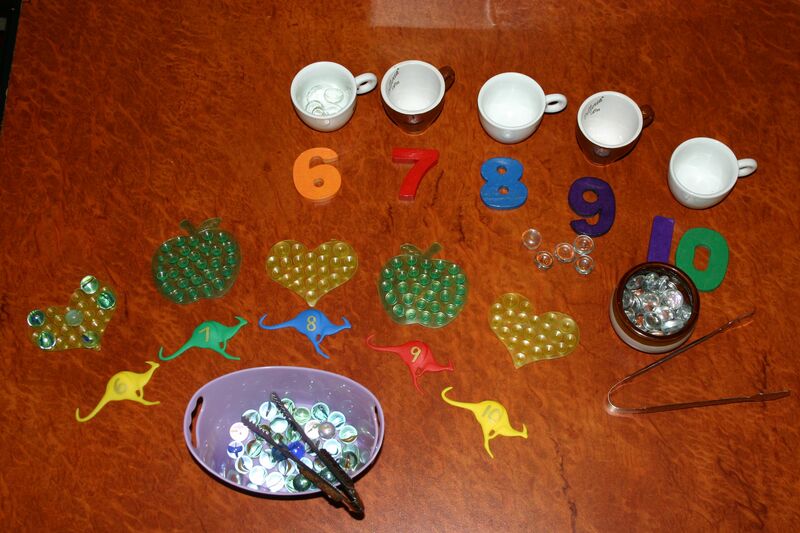 In the top activity the expresso cups are set out with the numbers in order from 6 to 10 and the child uses the tongs to add the correct number of sugar lumps to each cup. In the second activity the small tongs are used to transfer the correct number of marbles to the suckers on these soap holding shapes – the kind that suction onto your sink to stop the soap slipping away. We use Math-u-see for the first couple of years and Primer is the first book in the series. 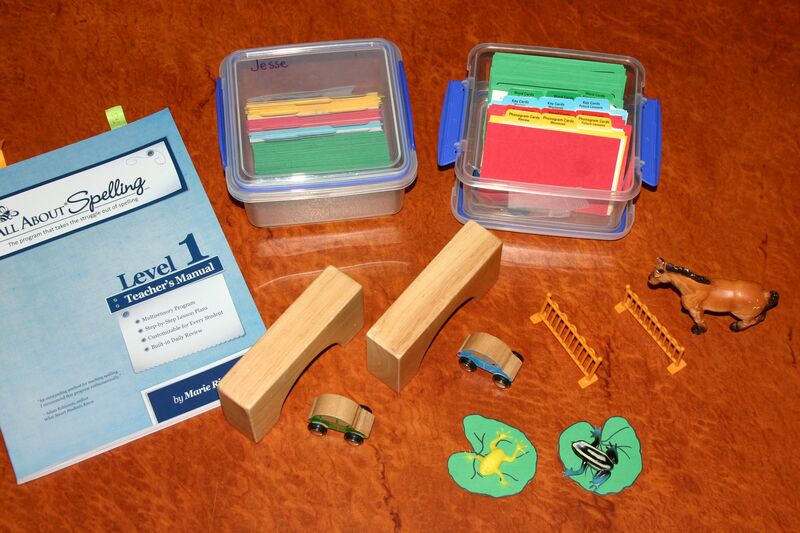 I cover all of the concepts with hands-on tray activities first and once they are well mastered the children can work through the book as a bridge to the bookwork they will be doing the following year. We also have the Dive CD’s which have videos for each lesson in the student books so some added “teacher” instruction is given as well to help fill any small gaps that may still be there. Tracing letters and numbers. 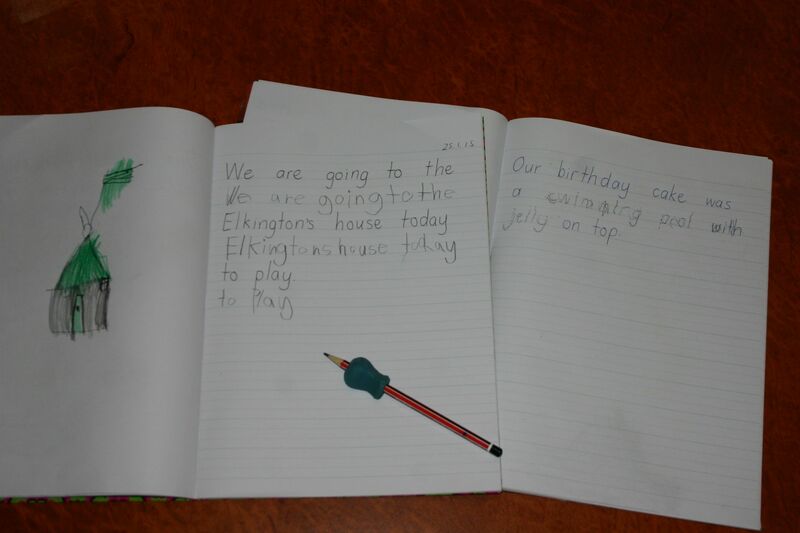 I try to supervise handwriting practise to ensure that the correct letter formations are being made. 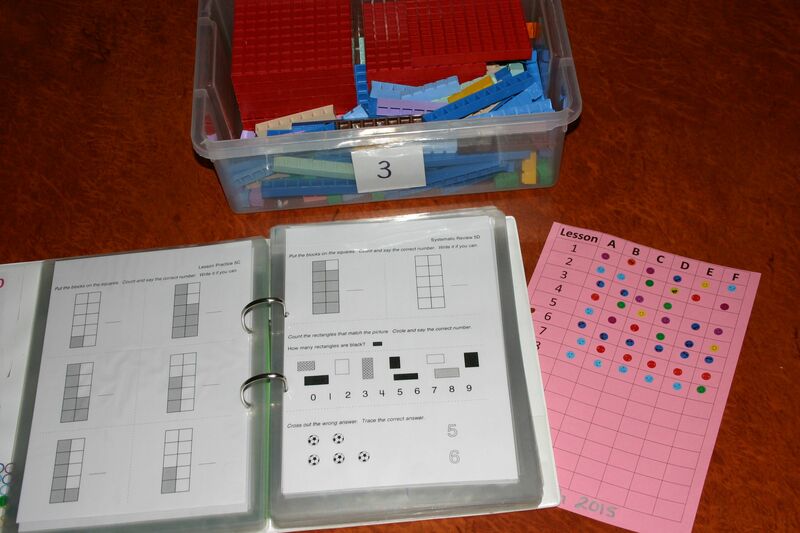 There are heaps of free worksheets on the net. 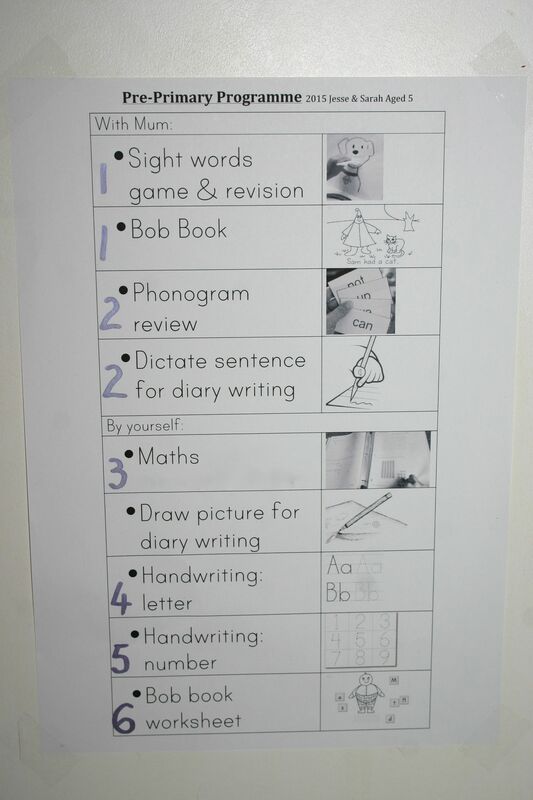 Look for some in your preferred font and laminate them if you choose for repeat practise. For children who find fine motor control difficult, the channel writing (bubble letter style) are the best because it allows more leeway than dotted letters for wobbly pencil paths. It can be very discouraging for children who try so hard and yet cannot stay on that dotted line. The “fat” letters to keep inside are somewhat more forgiving. I’m glad it’s going so well Gail. I also love your posts, and second the request for what you do with your olders. Wondering about where you buy your bingo markers from. Hi Lisa Things are rather busy here at the moment as all my commitments get started again over the next couple of weeks but I have it on my mental to do list and will get to it when I can 🙂 The bingo markers just came from a discount variety store – it used to be a $2 shop but there is no such thing in Perth anymore – more like a $2-$5 shop!